La Befana's Blessing Oil is a Roll on Oil with a warm scent of specially blended natural oils and pure resins, infused with Love and Good Intentions. La Befana's Blessing is to Wish Serenity and Wellness to All. This Roll on Oil is for "Topical Use Only". Roll Blessing Oil Onto Palm of Hands. Description Card and Boxed with a Gold Ribbon. *Please Allow 7 to 10 Days for Shipping. "Thank You" for Shopping La Befana's! Wishing you Many Blessings !! I Will Definitely Re-Order La Befana's Blessing Oil Again! 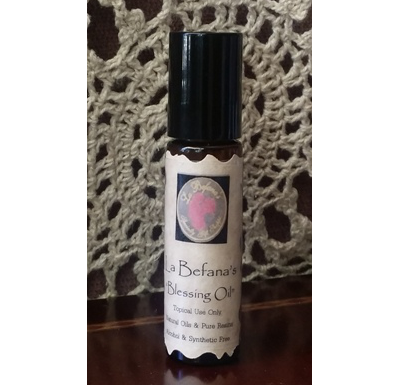 Loving La Befana's Blessing Oil!